As a sales manager, it's your job to keep your team producing. In fact, the status quo isn't enough and most sales managers need their sales teams to do even better, to keep their bosses happy. If you want to improve your team's numbers, you need to provide them with the tools to accomplish the task. That includes both physical tools (a good CRM program, solid lead lists, brochures, and other marketing materials) and mental ones (sales training, coaching, and general guidance). Most of the physical assistance you give your sales team will come down to helping them save time. CRM software automates certain tasks and keeps customer data organized, so it's easy to find information quickly. Giving lead lists and marketing materials to your team spare them from having to build these items on their own. As you take administrative work off your sales team, you give them that much more time to sit in front of prospects and sell which usually makes for a considerable improvement in their numbers. 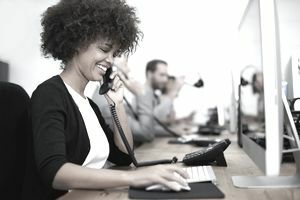 Ideally, you could provide your salespeople with an administrative assistant to juggle paperwork and generate form letters, while your team focuses entirely on selling. However, if that's not possible, at least try to give them the technology to speed up administrative work. Sales training is important and helpful to every salesperson, no matter how senior. There are always new ways to do things and new tools to master. At a minimum, your salespeople should receive regular training on your company's product and service offerings. Mental assistance is a bit trickier. If a given salesperson is having difficulties, you'll need to figure out what is causing the problem before you can try to solve it. Are they weak on cold calling? Do they have trouble closing? Maybe their territory is not as fertile as it once was. The best way to find out is to be familiar with your team's metrics. Know how many contacts they're making per day, how many appointments they're generating from those contacts and how many of those appointments result in actual sales. If a salesperson is struggling to meet their goals, you can review these metrics from the past few weeks and see which numbers are low. It's also a good idea to have regular one-on-one meetings with each salesperson. These can be brief, assuming there are no glaring performance problems. All you need is a few minutes to take their emotional temperature and give each salesperson a chance to air any grievances. Think of it as “preventative maintenance.” By talking regularly with your sales team and reviewing any questionable metrics on a regular basis, you can head off any developing problems before they start.